Former Republican U.S. Sen. Larry Pressler, an independent candidate for the U.S. Senate in South Dakota, speaks at a news conference in July in Sioux Falls, South Dakota. Last month, the battle for Senate control was shaken up when the Democrat Chad Taylor dropped out of the race in Kansas, clearing way for a contest between the center-left independent Greg Orman and the unpopular Republican incumbent Pat Roberts. Although Orman, who has led or tied Roberts in all subsequent polls, is not certain to caucus with Democrats even if he wins the race, this is nevertheless a major burden for the GOP. Were Republicans sure winners in Kansas, their chances of keeping the Senate would be 66 percent — instead of 56.5 percent, as it is in Tuesday’s FiveThirtyEight forecast. That’s the difference between being clearly favored and having odds just barely better than a coin flip. But could Republicans have another problem on their hands — in another prairie state? South Dakota’s senate race also features an independent candidate: Larry Pressler, the former three-term Republican Senator. In contrast to Orman, who had run a slick campaign even before he’d begun to receive national media attention, Pressler’s bid seemed more quixotic. He’d raised only $107,000 through June 30, has a website that looks more like a personal blog, and had even joked that he “might demand a recount” if he won. 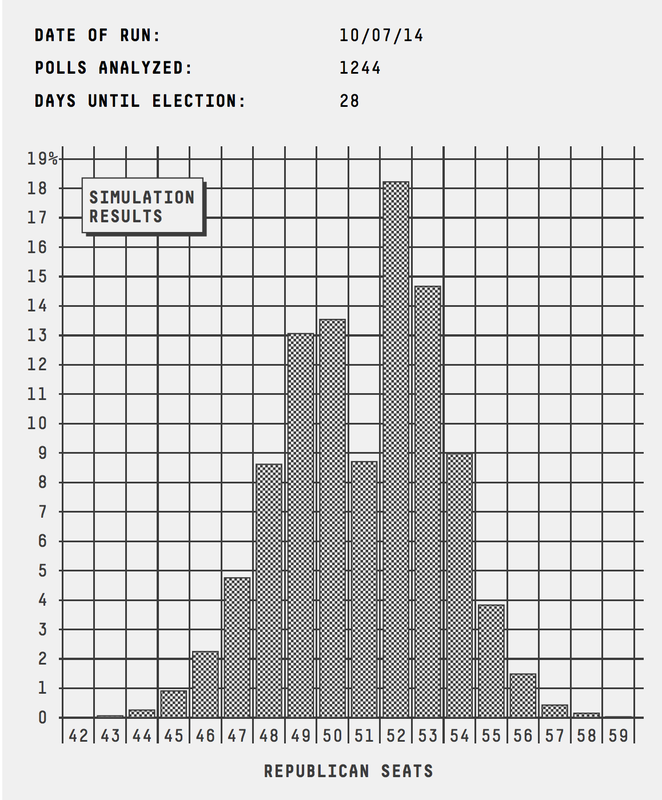 Three-way races are nevertheless quite volatile. So our forecast model had been accounting for some possibility that Pressler could give the frontrunner, the former Republican Gov. Mike Rounds, some trouble — either by winning the race himself or by splitting the vote enough to throw the contest to Democrat Rick Weiland. When it launched last month, the FiveThirtyEight forecast had given Rounds a 86 percent chance of winning — reasonably good, but not quite a sure thing. Rounds’ position had seemed to become certain in the subsequent weeks. Four polls of South Dakota in September put Rounds ahead by double digits against both Pressler and Weiland. Then this past weekend, a YouGov poll of the state had Rounds 15 points ahead of Wieland — and Pressler with just 12 percent of the vote. But a SurveyUSA poll of South Dakota on Tuesday told a different story. It had Pressler moving into second place with 32 percent of the vote and gaining ground at Rounds’ expense. Rounds led with 35 percent, and Weiland was in third with 28 percent. It’s not entirely clear how to reconcile the conflicting polls. YouGov’s low number for Pressler looks like a modest outlier, and it has also had low numbers for independent candidates in other states, including Orman. It may be that the firm’s methodology, which relies on weighting by party identification, is poorly equipped to handle races like these. But for the time being, SurveyUSA’s poll is something of an outlier as well — although SurveyUSA is by far the highest-rated pollster to have surveyed the state. There’s been more agreement about Weiland’s standing. No poll since August — including his campaign’s internal poll — has shown Weiland with more than 30 percent of the vote. His numbers have consistently been in the mid-to-high twenties. It’s hard to win a race under those circumstances. Even assuming that Weiland picked up some undecided voters and that some votes went to a fourth candidate in the race, the independent Gordon Howie, he’d have to hope that Pressler and Rounds split the rest of the vote almost exactly — hitting an outcome outcome like Weiland 34 percent, Rounds 33 percent, Pressler 32 percent, Howie 1 percent almost on the nose. That makes Pressler the more likely candidate to pull off the upset; he can gain ground relative to the frontrunner more quickly. The FiveThirtyEight model currently gives Pressler a 9 percent chance of winning the race, versus 3 percent for Weiland. Those chances will grow if more polls come along with results like SurveyUSA’s. Yet another complication is that Pressler has refused to say who he’ll caucus with. Our ideology ratings imply that he’s equivalent to a moderate Republican — just as they imply that Orman is equivalent to a moderate Democrat. So the model assumes there’s a 75 percent chance Pressler would caucus with Republicans if he wins, just as it assumes there’s a 75 percent chance Orman would caucus with Democrats. But Pressler endorsed Barack Obama in both 2008 and 2012 and has at times implied that he’d refuse to caucus with anybody. Rounds remains the favorite. It’s not clear that Pressler has enough money to run a substantial number of advertisements in the closing days of the campaign — or to finance a voter turnout operation. And for the time being, the SurveyUSA poll is mostly alone. But the race increases the chance that we’ll have a “messy” outcome on Election Day. Already, it looks likely that Louisiana will require a December runoff, and Georgia may require a January runoff. Orman, if he wins, will have to decide who to caucus with. Alaska, one of the most important races this year, is usually one of the slowest states to count its vote. There’s also the potential for a recount in one or more decisive states. If you’re an election junkie, you may want to postpone that mid-November vacation. Correction (Oct. 8, 1:38 p.m.): A previous version of this article incorrectly said Weiland had not garnered more than 30 percent of the vote in any poll this year. He hasn’t earned more than 30 percent in any poll since August.